It is well known that a trader must master their psychology and their mental game in order to become successful. Even the best trading strategy will not make a trader money if a trader keeps making emotional trading mistakes, engage in self-sabotage and fails to work on himself. The weakest part in any trading strategy is always the trader itself. The good news is, overcoming our shortcomings is no rocket science and it can be done by working on the right things. With this mental & mindset course, a trader can finally work on what is going to put him/her ahead of the competition. Over the course of 5 months, you will receive one new lesson each week consisting of an educational part – a video presentation – and a practical workbook. In the educational part, we provide the knowledge and show exactly how certain mental and trading concepts are interconnected, why we engage in specific destructive behavior and how to overcome it. In the practical part, we ask you to engage in weekly exercises, we post challenges or ask thought-provoking questions to get you to a new aha-moment week after week. The goal of the course is to get you to take massive action, provide the tools and the knowledge to improve your mental game week after week and help you optimize yourself and your approach to trading steadily. After a short introduction to the course, we get right into our first lesson. It is all about laying a solid foundation during the first 3 weeks. In lesson 1, we talk about traits, beliefs and core values. We learn how to audit ourselves in order to identify positive and negative beliefs that have been ingrained into our thinking throughout our life. Negative beliefs and core values can be the cause for self-sabotage or just bad trading performance. We need to make sure to identify those in order to slowly revert them and get into an abundance mindset. We then craft our mission statement – why are we doing what we are doing. A mission statement is empowering and keeps us pushing towards our vision. In order to improve confidence and become more professional, a trader has to define himself and his approach to trading. The amateurs, on the other hand, are walking around aimlessly without a plan and then receive inconsistent results. In lesson 2, we talk about validating a trading system and how to adapt a trading strategy to one’s own needs. 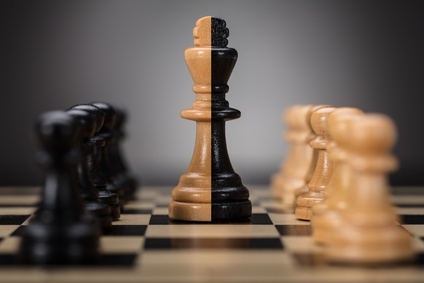 One size fits all does not work in trading and certain parameters of a trading strategy must be adapted to how the person executing the strategy thinks and where their strengths are. In the second part, we talk about standardizing and optimizing trading decisions to add even more consistency and clarity. We have all heard that YOU are your trading business. But what does it actually mean? In lesson 3 we learn how to set ourselves up for success. A trader takes different roles: the researcher, the executor, the auditor. This week, it’s all about creating professional structures and preparing our surroundings so that success becomes likely. To conclude our first month together, you will learn how to perform the optimal weekly/monthly review. Improvement is all about asking the right questions and today you will learn the 9-step process that will help you take the right steps in order to adjust and improve your trading approach week after week. 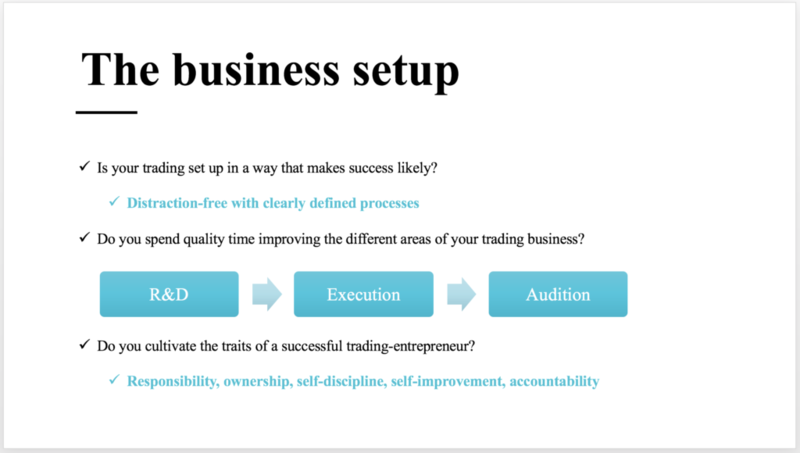 The 9-step process has been designed to provide a steady framework for a regular review of your trading, yourself and how you approach the markets. Together with the checklist and exercise book, you are equipped to conquer yourself and keep moving towards the best YOU. 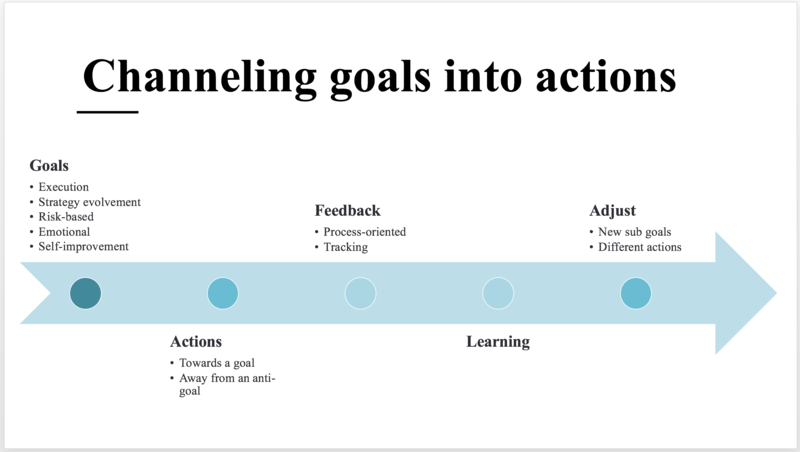 Although I am a huge believer and practitioner of self-improvement myself, I cringe at the regular goal-setting approach. In lesson 5, we get super practical and do our goal-setting in a different and fun way. We not only learn how to use trading goals to create massive action, but we also get started with primer questions that help us identify what we really want in life and how to get there. A confident person is often also a successful person. We need confidence in our system to follow the rules, stay in profits long enough, pull the trigger when a setup occurs and not lose faith during tough times. We also need confidence in ourselves and trust our own abilities. Week 6 is all about understanding our trading and our behavior in a much deeper way in order to keep growing and connect with ourselves. The markets are always changing and if you want to have a long-lasting trading career, you need to understand how to stay relevant in the markets. A trader who fails to adapt will blame outside circumstances, look for excuses and be constantly in a victim mindset. As a professional trader, you need to take control over your circumstances and learn how to keep going. This week we learn how to optimize our current strategies and how to create new setups and strategies to improve our long-term edge. Consistency is a major part of reaching success. The amateur is all over the place and the results fluctuate greatly – which, of course, also leads to emotional trading too. The amateur is always in a state of chasing price, chasing trades and feeling restless. The professional is calm, focused and knows exactly what he has to do to get the best possible results with the least amount of stress and anxiety. In week 8 we learn how to optimize our trading and the surrounding conditions for more consistency. Micro-management is a huge problem for the impulsive and struggling trader. Although the amateur might think that he is “outsmarting” the market by constantly fiddling with his trades, he is just the victim of his emotions and inner demons. In week 9, we learn to manage and set realistic in-trade expectations. We will also connect to our trader-self and audit our trading processes. Many traders suffer from variance-related issues where their account balance, but also their mood undergoes huge ups and downs. Week 10 is all about optimizing for less variance and stable account growth. What are some best practices in trading, intelligent risk-taking and trading with higher awareness (no woo-hoo spiritual nonsense, though)? How do prop firms hold their traders accountable and why is it so important that we integrate protection mechanisms into our daily trading? We learn how to utilize positive pressure in order to make better trading decisions, stop breaking rules frequently and start taking full responsibility. The name says it all: week 12 is all about becoming a PRO loss-taker. This lesson goes way beyond anything that you have ever heard and learned about how to take losses. The goal of lesson 12 is that you not only finally understand how to see a loss in the right way, but also embrace a loss as something that can change the way you trade and view the market forever. In week 2 we talked about core beliefs and negative patterns. In lesson 13 we take this to the next level and develop strategies on how to break inner conflicts to grow our abundance mindset even further. What is your current wealth-mindset and is it supporting or hindering you? We cultivate the winner mindset and eliminate our underlying triggers that keep so many of us from breaking free and living an extraordinary life. Where do you see yourself in 5 and 10 years? And what do you do to make sure that your long-term goals are not just a vision, but something that you will actually achieve? Develop an actional plan and cultivate the work-ethic and the mindset that is required to really push forward month after month. The successful people, athletes, businesses and entrepreneurs are all process-driven. They make sure that their daily actions and habits are in line with their priorities. Lesson 15 is all about creating a process-driven culture. 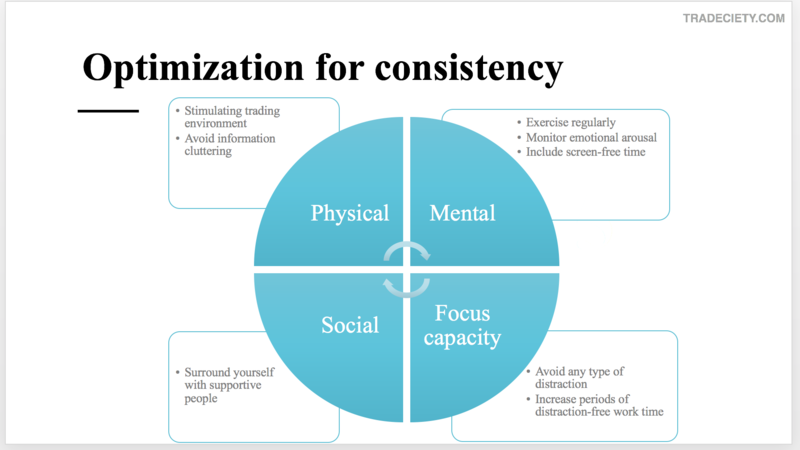 When it comes to idea generation, trade timing, risk management, self-management, self-improvement, emotional management or trade management a trader can optimize for success. This is going to be another very fun lesson that will generate many aha-moments. We all know those people who seem to be stuck in the same cycle all their lives. Whether it is dating the wrong partners, making the same bad career choices, constantly falling for false promises or just engaging in destructive behavior, repetitive cycles seem to be an important driver in human psychology. In week 16, we learn how to identify our negative cycles and what techniques we can apply to overcome those. And, of course, we will also take a look at how negative cycles impact our trading behavior. Week 17 is here: the final spurt! The goal during the last month is to get ready for the rest of your life – sounds cheesy, but you know that we deliver! In week 17 we look at how you can ensure that we keep on the right path even after completing this workshop. Regret is poison and the greatest sense of accomplishment often comes when we realize our full potential. Knowing that you always give it your all, that you do not leave any stone unturned and that YOU are in control over your destiny is surely empowering. Most people have been conditioned to follow general advice, get a “secure” job, not to speak up and not to stand out. There are certainly some benefits to that as you are not exposed to uncertainties and risk, but if you have enrolled in this course, this is probably not what you are after. In week 18 we learn what it takes to break free and how to start living your own self-determined life. Think bigger, eliminate the limiting mindset and really go after what you want your life to be. Mindfulness and awareness have a bad rep these days, but let’s not judge a book by its cover. In week 18 we learned that we cannot be a follower and that we must become someone who thinks and acts differently if we want different results. In week 19 we continue with this stream of thought and we learn how to re-connect with ourselves in a world where most people seem to have lost the connection to who they really are. We must wake up! Through creating awareness for ourselves and our trading we can make better decisions and start thinking independently – a skill that leads to success in any field. You did it! 5 months have flown by. But this is not the end. You are just getting started and to make the next steps easier and to ensure that you do not fall back into old patterns, you will now get our massive final workbook where we revisit some of the most important concepts. We will cross-check how our beliefs and our mindset has improved and how to move forward with momentum. Each week you get access to one new lesson. You can watch the lessons online any time you want. You cannot download the lessons. Do I get a trading strategy from you? No. This course does not include a trading system. We exclusively focus on the mental game and how to improve your current strategy. Can I get it all at once? The course is built in a way that you cannot peek ahead. You cannot go through the course faster. You only get one lesson every 7 days. The reason is that we want to make sure you take the time to follow through on the exercise and complete the workbook. How many times do I have to pay? The payment is a one-time payment. There are no ongoing costs and no subscription. After your payment, you have lifetime access.